In September 2018, my wife and I returned to Namibia for the third time to do a Self-drive Safari. Previously, the quickest and cheapest route when flying from Glasgow had been with British Airways via Heathrow, taking a night flight to Johannesburg, clearing Immigration there, then on to Windhoek the following morning. The last leg was by Comair which operates a network of internal flights throughout Africa on behalf of BA. Although the aircraft are in the parent carrier’s standard colours, they all bear South African (ZS-) registrations. Transiting Heathrow and Jo`Burg can be be pretty stressful, especially if you-re pressed for time, but KLM recently introduced a direct flight from Amsterdam to Windhoek. Schiphol is a fabulous airport and the outbound journey was a very relaxed affair compared with previous trips: A late afternoon flight from Glasgow took 1 hour 5 minutes, then it was just a 15 minute stroll to reach the transfer gate, compared with a mad dash through the crowds at Heathrow - no long distances or monorails. 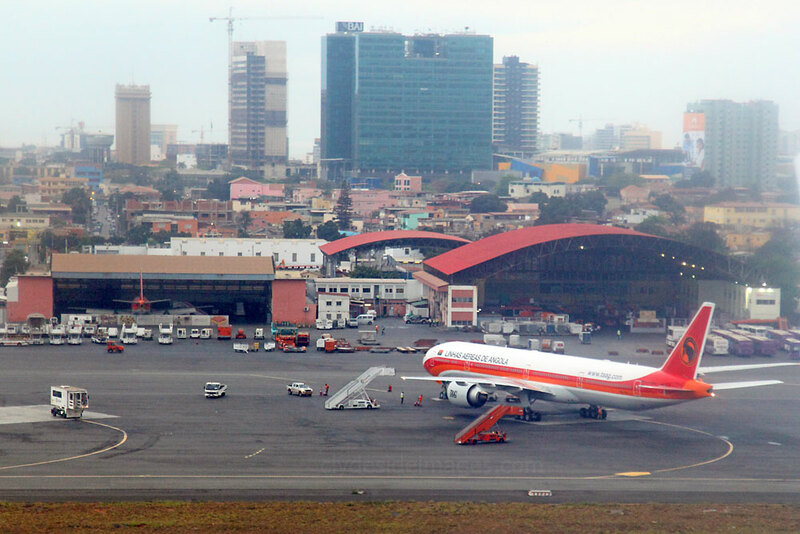 ​A major bonus for aviation enthusiasts travelling to Namibia with KLM is that the plane stops at Luanda, Angola, for around an hour for a crew change and refuel but passengers remain on board. Amsterdam-bound flights from Windhoek arrive in Angola during the hours of darkness, but on the way to Namibia, the stop-off is just after first light so there`s an opportunity for some snaps. ​I don`t think the authorities would tolerate spotters or photographers here, so this was a welcome opportunity to see some relatively rare military types. My images aren`t great quality as most were taken from the moving aircraft but they hopefully illustrate the variety of planes that can be found at Luanda. 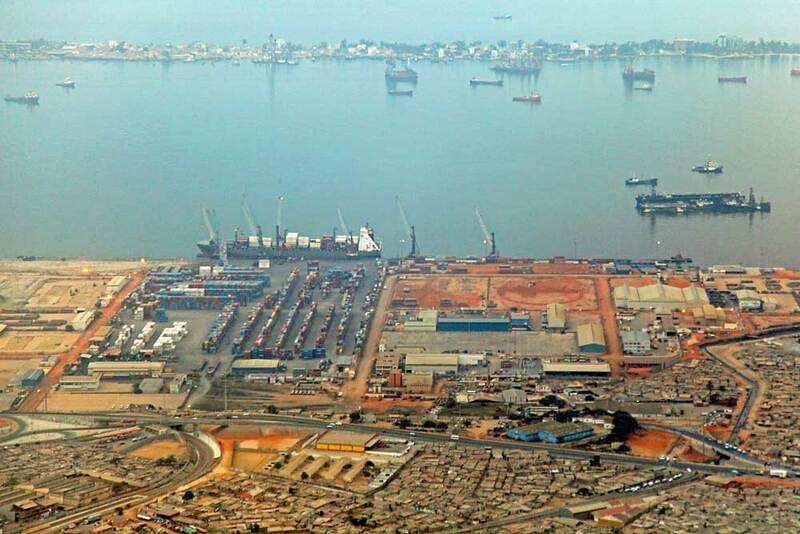 Angola has vast mineral and petroleum reserves, and its economy is among the fastest-growing in the world, especially since the end of the civil war. ​Grey skies greeted us as we descended over the sprawling city and a host of bulk carriers, Offshore Support Vessels (OSVs), tankers and general cargo ships were moored just offshore. Despite the booming economic situation, the standard of living remains low for the vast majority of the population and the country has a very high crime rate. Life expectancy is among the lowest in the world, while infant mortality is among the highest. The airport looked a very interesting place, with a fair number of older jet and turboprop airliners, biz-jets, helicopters and Soviet-built military transports all parked up. The only movements seen during my brief time on the ground were a departing Son Air 737 and Airbus A340-300 CS-TOA `Fernão Mendes Pinto` of TAP Portugal which taxied in to a stand adjacent to ours. Colour distortion caused by shooting through the aircraft windows was unavoidable in many cases. Boeing 777-3M2(ER) D2-TEH of the country`s national carrier, TAAG Linhas Aéreas de Angola. Lufthansa A330-343 D-AIKQ being refuelled on the tarmac. The maintenance hangars in the background each have a TAAG Boeing 737 in residence. Above left: Son Air Boeing 737-7HB(WL) D2-EWS taxis out for an early morning departure. SonAir Airline Services, S.A., commonly known as SonAir, is a venture of the Angolan national petroleum company Sonangol Group. It provides helicopter services to Angolan oil facilities, both onshore and offshore, as well as scheduled and charter services within Africa and to the United States. The Son Air fleet includes two Boeing 747-400s (operated by Atlas Air), Boeing 737s, an Airbus A319 and a handful of biz-jets. It also operates around 40 helicopters, the models being Eurocopter Super Puma, Dauphin, EC225 and Sikorsky S-76C. 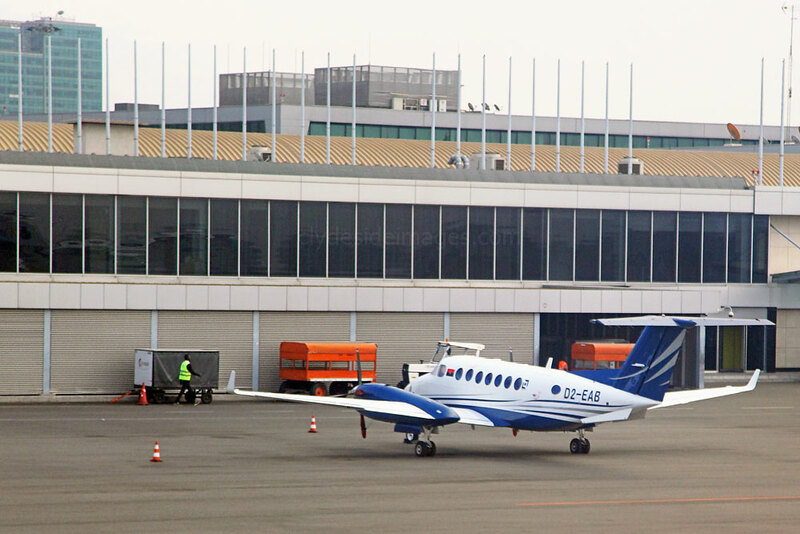 Right: King Air 350 D2-AEB, just one of many GA aircraft present. Some of the resident commuter props and oil industry support choppers. After the Portuguese administration left Angola in 1974, the country suffered from civil war, during which UNITA rebels claimed to have destroyed over 150 aircraft since 1985. 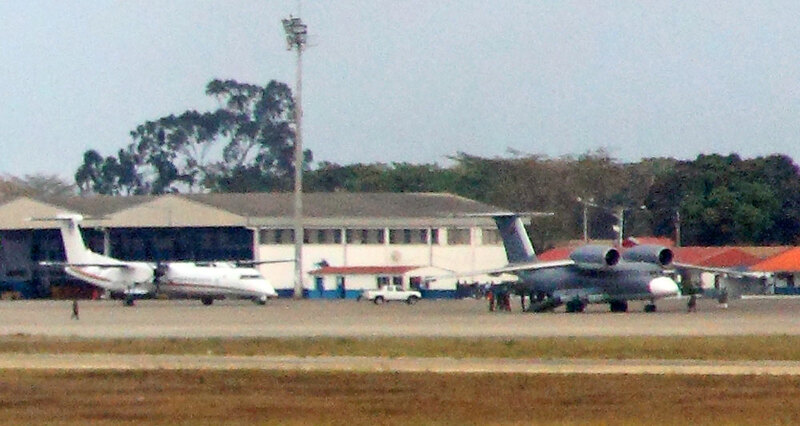 Although there is currently a large military presence at Luanda, the main operational base of the The National Air Force of Angola or FANA (Portuguese: Força Aérea Nacional de Angola) is at Catumbela, near Benguela. Mostly Soviet types are flown, both fixed-wing and helicopters. In 1991 six C-212 were purchased from CASA and in 1999, eight Su-27's were delivered with seven on order. In 2000 twelve ex-Slovakian Fitters were purchased. 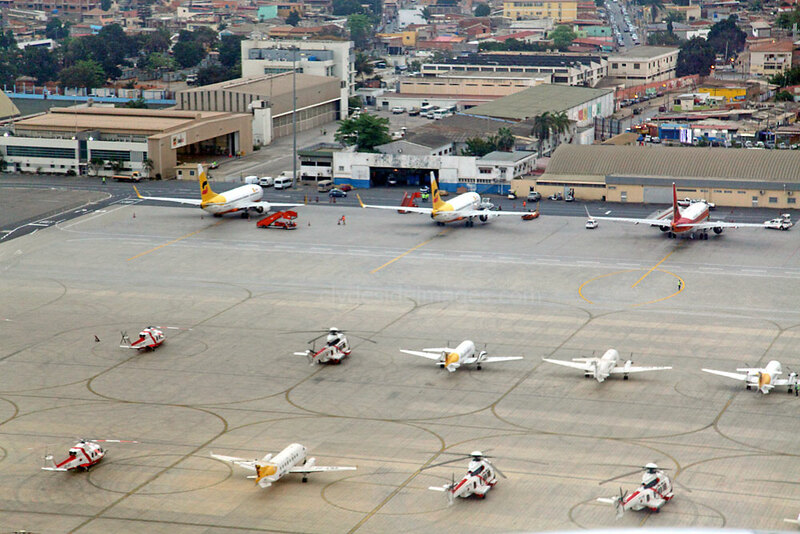 The Angolan Air Force uses also Pilatus PC-7's, PC-6's, BN-2 Islanders and King Airs. Twelve Su-22M4s have been sourced from Slovakia. 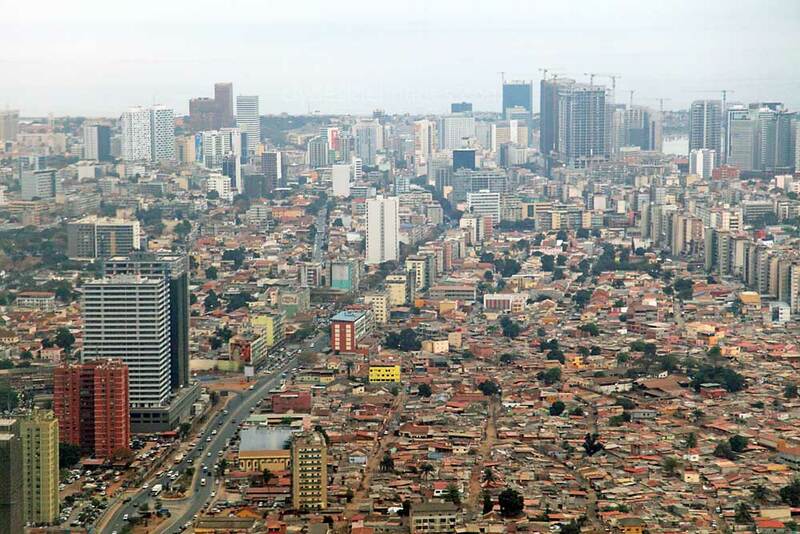 Angola became independent from Portugal on 11 November 1975 and the force was formally established on 21 January 1976 as the People's Air Force of Angola / Air and Antiaircraft Defense or FAPA/DAA (Força Aérea Popular de Angola / Defesa Aérea e Antiaérea). The FAPA/DAA fought several battles with South African Air Force aircraft in November 1981, October 1982, and twice in September 1987. ​By 2007, the name of the air arm had changed to `National Air Force`. With an inventory of more than 300 aircraft, FANA is, on paper, one of the largest air forces on the African continent but many are unserviceable older types. The main body of the active air force is made of transport/cargo planes, used for moving supplies, equipment and personnel throughout the country. Above: The shabby, all-white Boeing 727 bears the civil registration D2-ERV with King Air 200 D2-EXW alongside. Both are operated by the National Air Force of Angola. Some of the country`s Soviet-built helicopters can be seen in the following shot. Currently based at the Luanda Airport Airbase is the 23rd Air Transportation Regiment, comprising 5th Light Transportation Squadron which operates Antonov An-2, An-12, An-24, An-26, An-28, An-32, An-72, An-74, F-27, CASA C-212-300, C-212-200, BN- 2A-21 Commander Turbo, Dornier Do-27, Do-28C and Do-228s, the 6th Transportation Squadron with Ilyushin Il-76T, Lockheed L-100-20 C-130K, and Boeing 707s, plus the 7th Transportation Squadron which operates Boeing 707s and Embraer EMB-120s.